For those of you who know me personally, you know that I wear miniskirts. A lot. I may hate my stomach, but I do like my legs. However, I fell in love with the ground-sweeping long skirts that Olivier Theyskens showed in his last collections for Rochas, so I'm looking for at least one long skirt for fall, preferably in black. They were a bit hard to find (I'm assuming this is because long skirts tend to be in fashion during recessions, and no one really wants to encourage one of those), but I did come across some strong contenders. 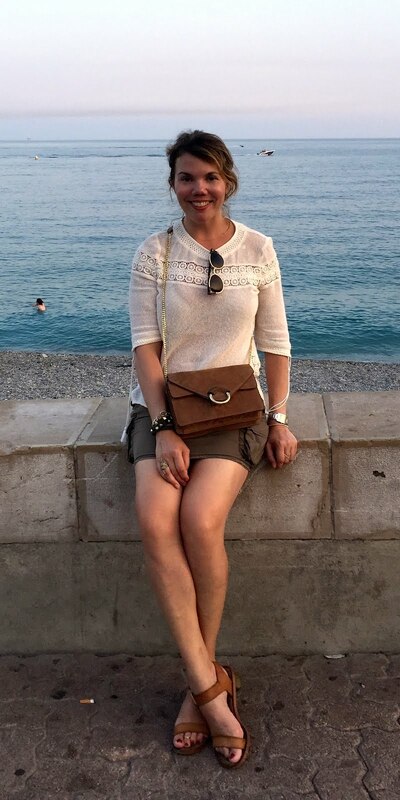 There are few things you can count on in life, but one of them is that anything Donna Karan makes in jersey is going to be both comfortable and flattering. So behold this long jersey skirt. It doesn't have the fullness I want, but the sleek shape makes up for it. 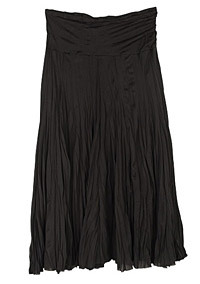 I love the plissé texture and shape of this chiffon skirt from Gaultier--it's kind of 1920s rich gypsy. It's not as long as I'd like, but it's gorgeous nonetheless. This chiffon skirt from Armani isn't really a daytime skirt, but with its lovely trumpet shape, who cares? 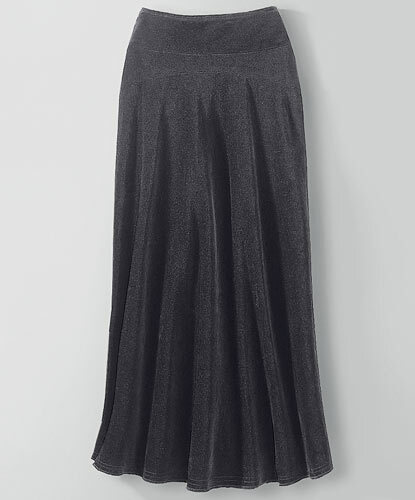 I saw this Marc by Marc Jacobs skirt at Barneys last weekend, and I must have it. After all, it totally fits into Marc's glam-grunge aesthetic for fall--it has a crinkly broomskirt texture and cuts a totally dramatic silhouette. 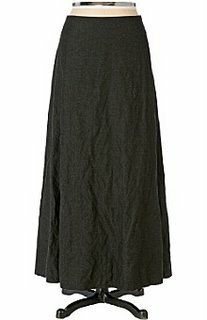 Of course, this jersey skirt from Love by Ya-Ya is a bit more laid-back, more affordable, and probably more comfortable too. It's a totally different look, though--kind of California girl...well, if California girls ever ditched their minis. The Daisy Miller skirt from Anthropologie is more in the vein of the Marc skirt, but with a more streamlined look and an easier-on-the-wallet price. 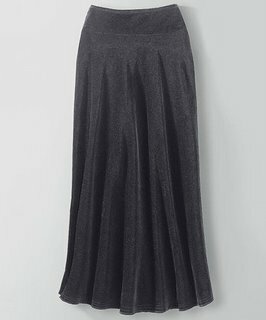 Newport News has all manner of long skirts; here's a nicely shaped one in black corduroy--cute and warm too! This mesh skirt from Alloy has the broomsticky look of a Marc Jacobs skirt, but with a shorter and slightly less full silhouette. And, um, a much more tolerable price. This Alex Evenings skirt is meant for, well, evening, but I think it can pass for daytime--after all, a sheer panel of chiffon at the hem does not necessarily an evening look make. And, hey, it has an elastic waistband--after so many constricting skinny jeans, I'll take it!